If you know me at all, you know I'm a HUGE fan of contemporary novels. I can't help it, they are my faves. 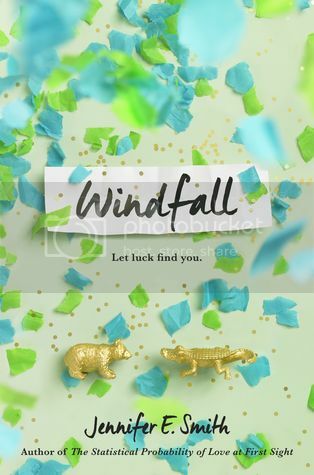 Windfall showed up on my doorstep a few weeks ago, and I absolutely can't wait to start it. Just judging by the summary, it sounds like it's going to be a really great read. That's a totally new to me one! Doesn't sound like my kind of read but I do hope you thoroughly enjoy it once you read it! I can't wait to hear your thoughts on this one! It sounds like a fun summertime read. Great pick! I love Jennifer E Smith and super pumped for this one to come out!! Enjoy! Ooh it sounds good! I love Jennifer E Smith's books I love contemporary books too! Nice pick! I've not read a Smith book and I'm not even a YA contemporary person BUT I am curious about this book! It sounds like something I would enjoy, so I think I'll give it a shot. I hope you love this book when you get the chance to read it! I love reading contemporaries, too. I can't wait to read this! I like the author's previous books.